Have you ever walked into a pub or restaurant, drank a coffee and felt an immediate sensation of sorrow and regret? What? Is it just me? Of course not! Everyone who drinks coffee had this happened to them. That’s probably because the person who brewed the coffee doesn’t know how to do it properly. Or it’s the same guy who makes the pizza. When it comes to coffee, everyone wants the best. There is no denying it. So why do we still “treat” ourselves with cheap, low-quality mud water that we call coffee? Surely we can do better than that? Of course, we can! 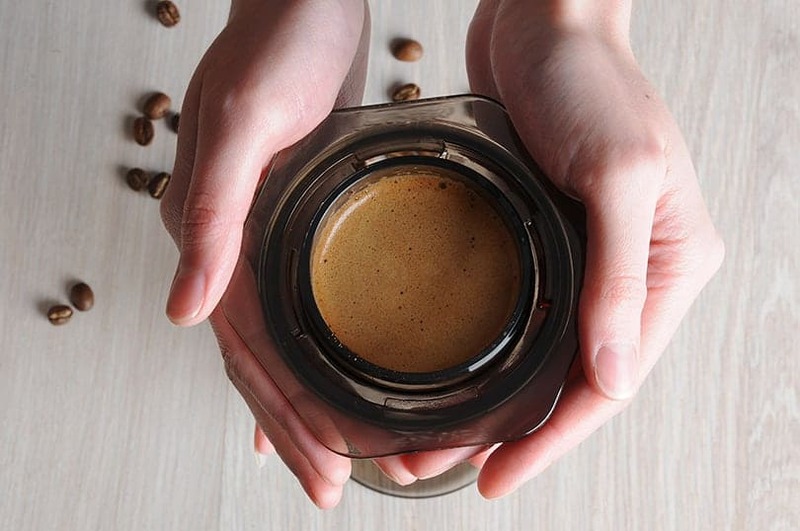 Have you ever heard of the AeroPress Coffee machine? No? Well, sit down and let me tell you everything about this new coffee brewing machine. 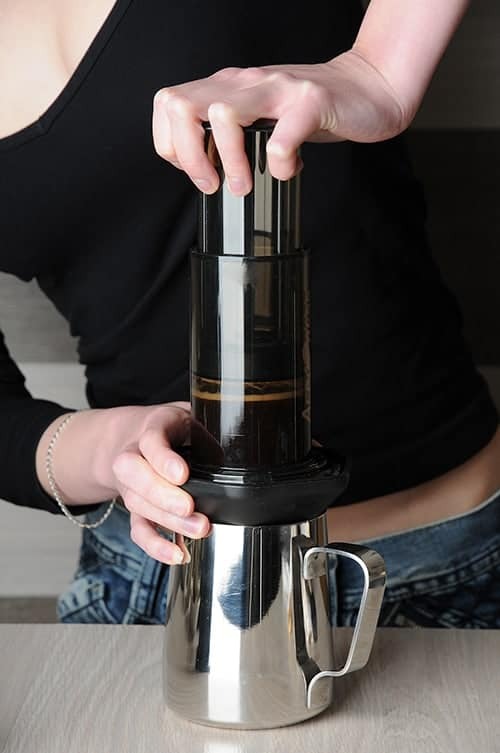 The AeroPress was invented in 2005 by Alan Adler, president of Aerobie. In this machine, the coffee is steeped for ten to fifty seconds and then it’s pressed through a filter. This is done by applying pressure to a plunger through a tube. What are the Advantages of Such a Brewing Method? Well, it takes about thirty seconds to brew the coffee. And believe me, thirty seconds is enough for me not to start bungee jumping from a skyscraper so that I can remain awake. It also has a higher pH than drip coffee. And, don’t worry; it has roughly the same concentration as an espresso, so you’ll be like Flash at work. Now that we got your attention with the whole espresso thing, let’s see how you can brew a cup of delicious coffee with the AeroPress. This inverted method is tricky because it will require flipping over the device. So be very careful because you can spill near-boiling water on your hands. So, let’s start cooking, shall we? Get your 200 grams of water and 17 grams of coffee ready. If you are not sure how much water or coffee you are using, use a kitchen scale. Take the coffee and grind it until you get to a texture finer than table salt. Take the AeroPress filter and place it on the detachable black cap. Before going any further, water your cap and filter. It will make the filter adhere to the cap so that they will function better together. It will also cause the filter to lose that paper flavor so that it won’t affect the coffee’s taste. It’s time to assemble your AeroPress device. Make sure that the instrument is clean, and that it doesn’t have any cracks or other physical irregularities. Also, ensure that the device is dry because moisture can affect the machine’s seal and quality of brewing. Place the device upside down on the scale; the numbers on the instrument should be upside down. Add the ground coffee to the machine. Be careful not to spill it in the orifices of the apparatus. If so, clean it so that it won’t affect the brewing process. Heat the water until it gets to ninety degrees Celsius or two hundred degrees Fahrenheit. Add the water to the device. It is recommended to add two times more water than coffee. In our case, for fifteen grams of coffee, 34 grams of water should be enough. The coffee must be saturated evenly. To ensure that, you will need to tap it lightly with a spoon or a butter knife. Use the rest of the hot water, should be around 170 grams of water left, to fill the chamber. Remember to have the device secured on the table or you will risk burning your hands with boiling water. Wait for a minute, then start stirring the coffee to ensure that the mixture is complete. Place the cap on the chamber and secure it tightly. Pro Tip: Put your clean, empty cup on the cap and flip the device. That way, you won’t spill the liquid when you flip the coffee appliance. Flip the device fast but still maintaining control; that’s the whole trick. Switch the direction of the device until you can see the numbers in the correct position. Apply downward pressure to the other end of the apparatus. If you start hearing a hissing sound, then it means that your coffee is fully brewed. This also means that the water has been depleted from the device. It is best to press the plunge slowly and not too hard because the device can slide away. Press evenly to avoid spills or other accidents. If you push too hard, you will get the dregs of your coffee, and it will taste bitter. Of course, if it’s what you want, there is no problem with it. Start by unscrewing the cap, dispose of the used coffee filter and condensed grounds by pushing the AeroPress’s interior part. The device can be cleaned quickly, and it will be ready for another round. Now you can enjoy a fresh cup of coffee made in the AeroPress style! Pro Tip: If you think that the coffee is too strong or not diluted enough, add some water to your taste. It is recommended to add water in small increments so you can be sure that you won’t ruin your coffee by adding too much water. With each and every brew, you will get better at it, and you will find the perfect ratio between water and coffee. You won’t even need to be guided by the hissing sound to know that the AeroPress ran out of water. For this method, you will need the same ingredients and equipment as with the inverted method. The upright method will work as a dripping brewer. The water should have a temperature be between 195 and 205 degrees Fahrenheit. You don’t want the water to be boiling because it will burn the coffee. The coffee beans should be ground until you get a texture close to table salt, finer if possible. Twenty grams of beans should be enough for a cup of coffee. It’s time to pour some water on the filter to remove that paper flavor or residue from it and get it ready for brewing. Some people prefer to use a metal filter, but it’s up to you. Get your chamber ready. Place the coffee first and shake the chamber so that the coffee covers the walls. Take the hot water and let it rest for two minutes so it can drop in temperature. Now is the perfect moment to pour the hot water in the chamber, but just a little bit so you can create the grounds. Allow the coffee to bloom, to interact with the hot water. Don’t throw the whole kettle in there. This process should take around forty seconds. Now it’s time to add the rest of the water, stir two times and let it sit for a minute. It’s time to plunge your coffee out. Don’t press too hard and don’t do it fast. A good coffee takes time, so gently apply pressure on the plunger in a downward direction. When the water reaches the top of your grounds, it’s time to stop. If you want a sharp, bitter coffee, you can push all the way through. After you are done with your cup of coffee, rinse and repeat. People consider that the coffee resulted from the upright method has a slightly different taste than the inverted method. We suppose it’s up to you to experiment with both. Insert the plunger into the chamber, so it is a quarter inch in. Add the ground coffee. If you have a coffee scoop, three scoops of coffee should be enough for this recipe. Add the hot water; eight to ten ounces should be sufficient. The mixture should be very close to the top. It’s time to use that spoon. Stir the mixture, so the coffee is well combined with the water. Get that ice ready. Place the ice cubes in your plastic cup. Screw the cap on. Remember to water the cap and the paper filter first. 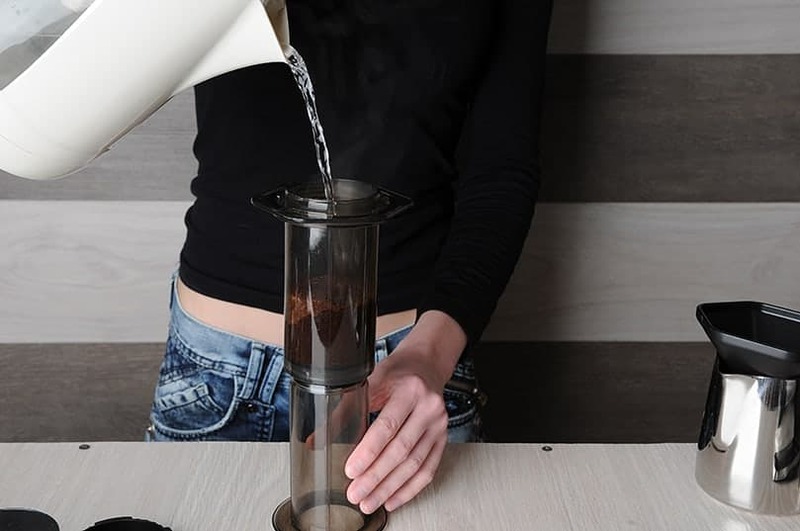 Place the AeroPress on top of the plastic cup and push the plunger gently. Push until there is a tiny bit of air between the compacted coffee and the plunger. If you want a bitter taste to your coffee, you can push a little bit more. You can add sugar or cream or both. Because some of the ice melted during the brewing process, you can add some ice cubes on top of your coffee. Your ice coffee is ready. It’s time to enjoy it. For this recipe, you will need the AeroPress, coffee, sugar, a mug, milk (the fattier, the better), and the AeroLatte milk frother. Prepare you coffee using the AeroPress. You can use the inverted or the upright method; it doesn’t matter. After you placed the cup on, let the coffee brew in the AeroPress for a minute. While the coffee is brewing, get a mug, and pour warm milk. The cup should be half full of milk. Get the AeroLatte, place it in the mug of milk and start frothing the milk. Do this until the milk is foamy. If you don’t own an AeroLatte, you can use a kitchen mixer or do it with other kitchen tools. Place the AeroPress on top of the mug and gently push the plunger. Push it until a thin layer of air remains between the plunger and the compacted coffee. And you are done. Of course, you can add sugar, some cinnamon or other spices that you like. Pro Tip: If the coffee is too sweet or you need something to compliment the smooth milk foam, you can push the plunger a little further. This will make the coffee a little bit sharper, in other words, bitter. Of course, these are just a couple of recipes you can prepare. With the AeroPress, you need only imagination and patience, and you will be trying all sorts of coffee recipes in no time. You can also watch online tutorials or read recipes made from baristas from all over the world to discover other delicious coffees. So, now that you know how to use the AeroPress machine, you can experiment with both brewing methods. 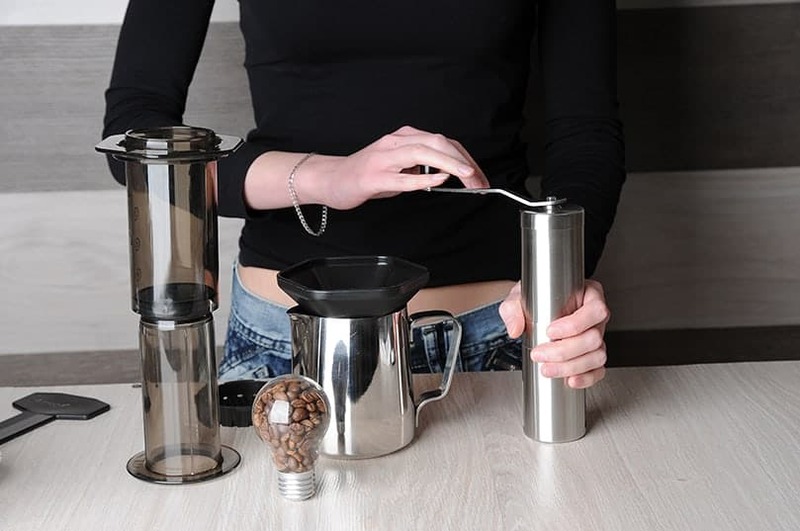 This device will offer a different take on making a good coffee. It will bring more life into your beverage and provide a unique flavor all around. Have you ever used this machine? What did you think about it?